I don’t write about it much, I think because it is so engrained I don’t think about it, but there is a huge food legacy in my family. My grandmother ran the colliery canteen, her catering was legendary. My grandfather ran a dairy and had an amazing kitchen garden, my Dad is a consultant food scientist, my brother is a foodie. On the other side my mum gave me the legacy of vegetarianism and wholefoods. One of my earliest memories is of waiting for her outside the healthfood shop to get a jar of peanut butter refilled. Gran brought me the legacy of post war comfort and convenience food, toasted tea takes, tinned peaches and crinkle cut oven chips. Substances sneered at by the rest of the family. Perhaps my cooking, although perfectly good, has been somewhat overshadowed by the legacies of my predecessors. I’m not sure what my grandmother would have made of Nigella’s approach, her frivolity offends the scientist in my Dad, who much prefers Delia’s measured approach. But, in a nod to my maternal Gran, I love the comfort factor and indulgence in Nigella’s approach. I love to read her cookbooks, and the way she writes so passionately about food. 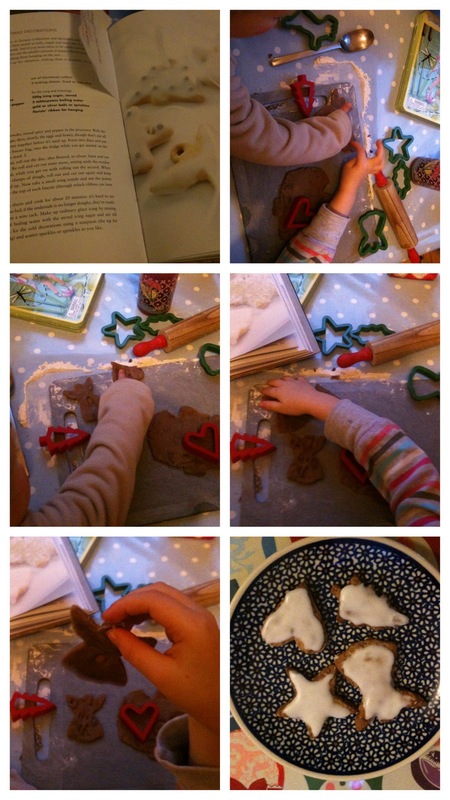 My favourite chapter in How to be a Domestic Goddess (how I love the irony) is the one about Christmas. Nigella really encourages the reader to find their own Christmas traditions. And so I did, with her Lebkuchen. We make Nigella’s Christmas Biscuits each year, wrap them up in greaseproof paper and string, and give them to relatives. If you are really good at baking, and very patient, you can make holes in them and hang them from the tree. Pointless exercise here, they’d be eaten in seconds. Find Nigella’s Christmas Biscuits recipe here.